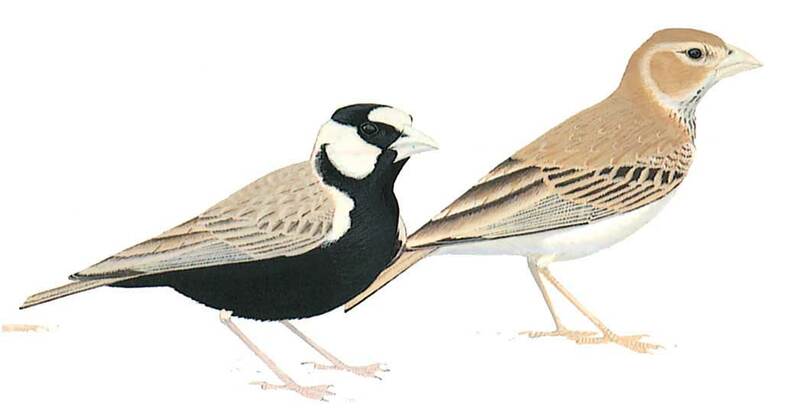 Small stocky lark with stout, deep-based, pale blue-grey bill with curved culmen. Male unmistakable with bold black and white head pattern, black underparts and underwing-coverts. Female has unstreaked pale sandy grey upperparts, faintly streaked crown, pale face and hindneck, pale buff underparts, faintly streaked across upper breast; blackish underwing-coverts always separate it from other small larks. Juvenile recalls female but breast more streaked; separated from Lesser Short-toed by paler heavier bill with more curved culmen, unstreaked upperparts, shorter, more rounded wings and shorter tail and colour of underwing-coverts. Fairly shy; bobbing flight; male’s display flight comprises circling on slow vibrating, lifted wings, interrupted by short glides.